Even though January and February and not known as months for superb exhibitions there are a few noteworthy ones happening now and on tap for the coming weeks; I'd like to share a few. 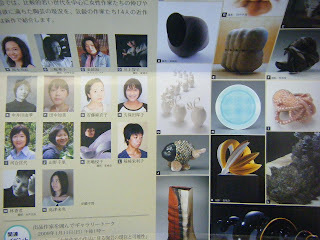 First off is a fine look at contemporary women ceramic artists being held until February 26th at the Paramita Museum (Japanese only http://www.paramitamuseum.com/) in Mie Prefecture. 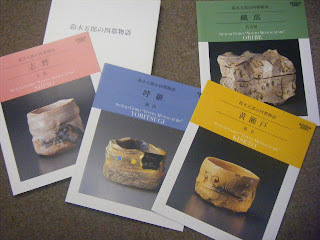 There is a small bilingual catalog available for the exhibition and please inquire at the museum. In Tokyo at Musee Tomoo there's a look at three generations of the famous Seto-based Kato family. 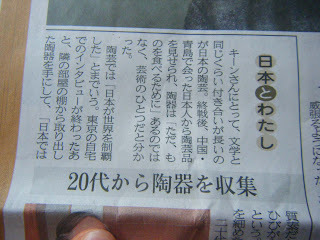 Now which Kato family might that be you ask as it seems *every* potter in Seto has Kato as their last name! Well, this time it's the legendary Kato Tokuro(1898-1085), his son Shigetaka(b.1927) and grandson Takahiro (b.1972.) that runs until March 8. A talk by Shigetaka is happening January 31st, while a gallery talk by Takahiro is set for February 21; more information can be found at the museum's homepage at http://www.musee-tomo.or.jp/. 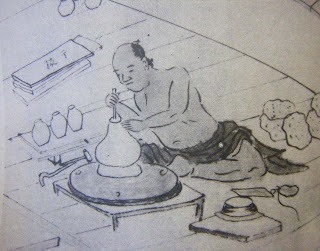 Not far from Seto is where the master potter Suzuki Goro lives and creates his interpretations of classic Mino styles. To celebrate the 100th anniversary of Takashimaya's founding, a four-city concurrent Suzuki Goro exihibition will be held from February 18th to the 24th with Tokyo showing Ki-Seto, Yokohama gets Yobitsugi, Shino goes to Osaka and Nagoya naturally takes Oribe. 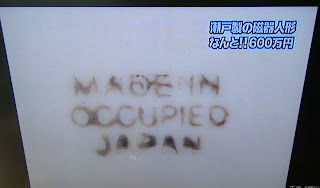 This is an unprecetended one-man exhibition style that I've seen since being in Japan since 1984. On a smaller scale, yet also at Takashimaya, Tokyo is a favorite Mino artist of mine Hori Ichiro from February 4-10. 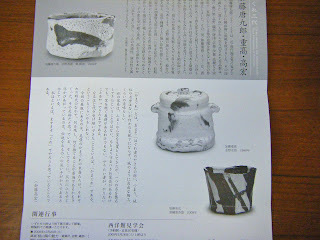 Two celebrated Hagi ceramic artists also have large exhibitions and they are Okada Yu and Kaneta Masanao. Okada just published a book titled the 'Color of Flames' (unfortunately the cover spelling of flames is flams) that showcases his quest to bring that orange flame tone to his works. 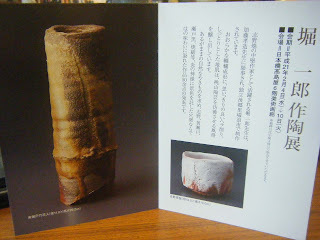 The exhibition also celebrates the 200th year since the founding of the Okada kiln. The exhibition will be at Yokohama Sogo from February 3-9. Kaneta is showing from February 18-23 at Nihonbashi, Mitsukoshi; a nice exhibition catalog has been published also for his exhibition. Please note the photos shown here start from the bottom working their way up for the order of the exhibitions noted. About Japan; in fact he's most likely the one of the most knowledgeable folks on the planet about things Japanese; Donald Keene is his name (http://en.wikipedia.org/wiki/Donald_Keene) and he loves ceramics. 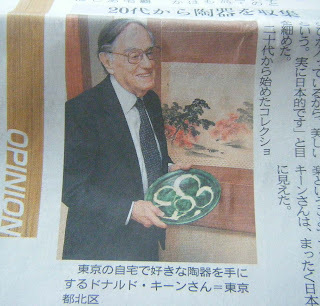 The other day my son was reading the Shizuoka Newspaper and called out that there was a brief article about Keene-sensei and it was devoted to how much he loved Japanese culture and pottery the most. 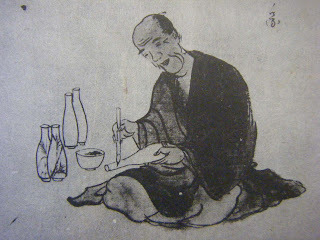 In one hand he's holding a bowl and although it does not mention the name of the potter, from the glazing and design I'd place a bet on Tsuchiya Noriyasu. 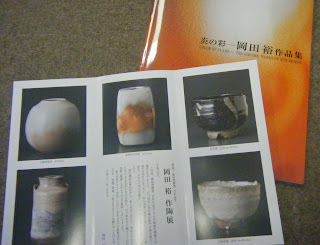 In the major retrospective book on the late legendary ceramic artist Tsuji Seimei, Keene wrote in the opening essay, "Some years ago I visited a museum in Australia which had a good collection of the pottery of the whole world. The European examples--especially the large Italian majolica plates--bored me and I had not the slightest desire to possess one. The Iranian pieces were more interesting, but almost every one had been patched together from fragments. 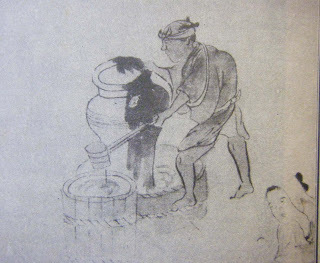 The pottery of China and Korea was, of course, splendid, and I coveted much of what was on display. 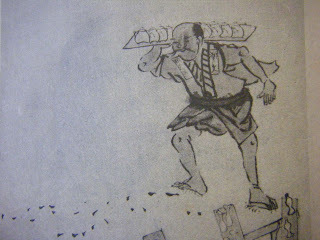 But I was most affected by by the works of Japan, especially the kind I disliked thirty years ago from Bizen and Shigaraki." I found this passage from the essay--where Keene also praises the works of Tsuji to no end, as he should--rather profound as it shows Keene's understanding and appreciation of worlwide ceramics (even though he only mentions a few, he has looked at all) and how his appreciation of Japanese ceramics deepened over the years; as I've written before, Japanese ceramics, such as Bizen and Shigaraki, do not jump out to the viewer with glittering beauty, it's a quiet inward dialog and one must have a mature and open-mind to even initiate the conversation. 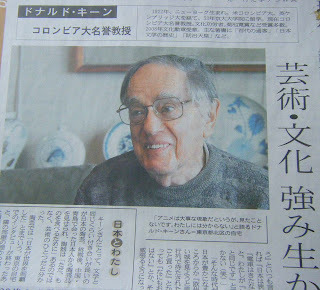 No wonder Donald Keene is such a respected authority on Japan, and beauty. 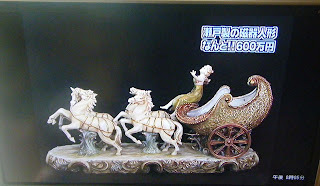 Here in Japan there's an extremely popular TV program called Nandemo Kantei (We'll Appraise Anything), sort of like an Antique Roadshow overseas. It's quite an entertaining program and the appraisers, mostly dealers, are now celebrities. 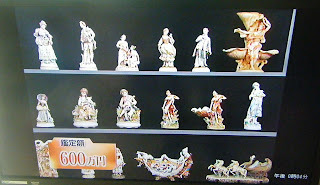 Anyway, over the New Year's holiday I was watching the program with my daughter and some lady on the show had a collection of porcelain dolls that looked like they were made in Europe. Turns out they were made in Seto and as all pieces of the post-war period were made for foreign tastes and thus for export. 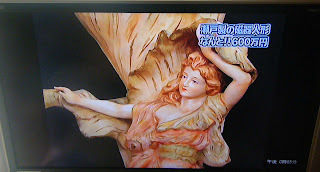 As such few remain in Japan and her collection was valued at a whopping six million yen! Next a rather cocky gentleman appeared saying how his Chosen-Karatsu mizusashi was a masterpiece from the Momoyama period (16th C.) and the authenticated box signed by Katsura Matasaburo went to prove it. He placed a value of two million yen on it. I looked at my daughter and said gansaku or fake; the glazing was so off, the form tight as a....., and the hakogaki box writing not fluid at all. Keika (result), 5,000 yen or thereabouts, don't remember the actual number. Boy, was he not happy at all! The show airs weekly with re-runs all the time. A very happy new year to visitors of my blog, of which a new year's resolution is to update it more frequently! 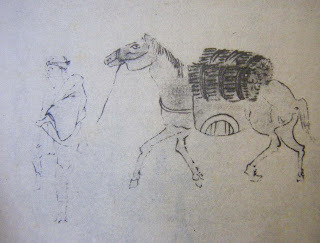 I have a few new blogs in the shadows, yet let's start the new year picking up with photos noted about the old ways of Shigaraki, more photos from this rare book soon.